History : 1991 : Acquired for free. 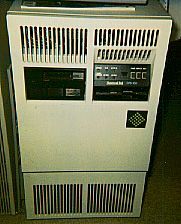 In the late 80's, my employer at the time, was using this system for software development. When they were forced into closing their doors, they gave me the system so I could contract out to support our old clients. It was really a nice Unix system at the time and is still a fast little box. Well, not so little I guess since it is 27" x 30" x 15". One day I'd like to see about bringing up X Window or some of the GNU software on it but don't seem to have the time right now. These days I use it mostly to store backup copies of my PC software though once in a blue moon I do still get a call for support from one of our old clients who are still using our software even though the company is no longer around (we built it good eh Jay? :-) ). If you use one or have something for one that I might be interested in, email me.